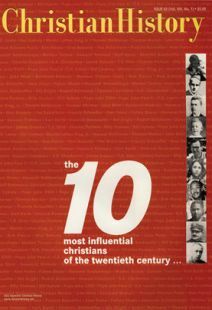 THE JOURNALIST IN ME is pretty happy with this issue’s title, “The 10 Most Influential Christians of the Twentieth Century.” It’s got bite, appeal, and it begs for an argument. And I had a lot of fun pulling the list together: after reading the results of our poll (see “What Do You Think?") and sifting that through my experience and reading, this is what came out. On the other hand, the historian in me is nagged by the qualifications that whisper their disapproval. First, among the readers and scholars we polled last year, one exclaimed: “I am amazed by the list of candidates . . . as if the entire church consisted of Westerners!” Valid criticism. Then again, had we put, let’s say, Africans John Chilembwe and Simeoni Nsibambi on this list, would they have garnered many votes? I doubt it. Nearly all Christian History readers and scholars (and the editor) are Westerners; we know the West; we've been affected by the West. We could hardly vote any other way. Besides, influential Westerners in the Northern Hemisphere have unparalleled access to mass media, and they have, for better or worse, received disproportionate exposure and so have had disproportionate influence. That’s the way the world is at this point in history. Second, one fellow editor in the Christianity Today International, building, was especially incensed: "How could you leave out so many women, like Henrietta Mears, who discipled men like Senate chaplain Richard Halverson and Campus Crusade founder Bill Bright?” Point well taken. Yet other than leaving off Mears, I have no regrets in this respect. The historical fact is that for the bulk of the twentieth century, Christian women have been excluded from public influence. I'm sure my editorial heir in the year 2100 will have a lot more female names on the ballot listing the most influential Christians of the twenty-first century. This is why, I'm sure, more than one reader ignored our instructions (to note only those who have had a public influence) and put down as most influential a father, mother, or pastor. For good reason. Those most close to us will remain the most vital influences. Ethnic congregations were essential for building community in the nation’s most diverse region.